Have a question about the Food Bank? Chances are, others are asking the same! See the most frequently asked questions. We collect basic personal data about our clients, including name, address, and contact details. Our new central distribution warehouse and administration center is located just north of Morpeth and within the site of Northgate Hospital. 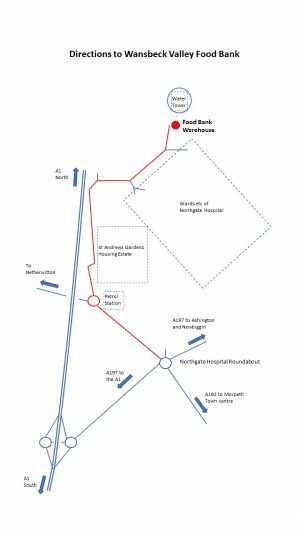 Make your way to the Northgate Hospital Roundabout and take the exit signed Northgate Hospital. Once within the hospital site take the first turning on the left [singed Kenneth Day Unit] and then first left again. Are you in need and running out of food? Or do you know a family without enough to eat? Wansbeck Valley Food Bank will provide emergency food for a minimum of three days. Who does the Food Bank serve? The food bank serves those in financial hardship who have been referred to us by one of our many referring professional organisations and individuals. What are the Food Bank Opening Hours? Who donates food and groceries? The work of the Food Bank can only continue with the generosity of individuals, families, groups, schools, churches and local organisations. We also have a monthly supermarket collection at Ashington ASDA and a permanent basket in the Morrison’s Morpeth store. Where are the Food Bank Distribution and Drop Off Centers Located? Currently we are operating out of locations based at Morpeth, Ashington and Newbiggin from which we both distribute and receive food donations. What Kind of Food is Needed? In addition Shower gel, Shampoo, Toothpaste, and small Bars of Chocolate would be gratefully received. How do I volunteer for the food bank? How many people use the food bank? Throughout the past year Wansbeck Valley Food Bank [WVFB] has been able to supply something in excess of 13,000 day’s-worth of food to local residents. And if that figure is difficult to grasp then imagine that every day last year, thirty-six people received a full days supply of food which adds up to almost 40,000 meals.! How many paid staff does the food bank have? The food bank has been in operation since 2013 and in all that time has operated on an entirely voluntary basis. However by 2018 the scale of our operation had grown to such an extent as to place unreasonable demands on core members of our management team. To ease those burdens and to provide an effective and efficient service to our clients the trustees have take the decision to employ a salaried administrator. Is the food bank a national organisation? Wansbeck Valley Food Bank is an independent local charity set up to help prevent and relieve poverty or financial hardship. We operate in association with local social services and other professional agencies. What does the Food Bank do? Wansbeck Valley Food Bank is a local charity set up to help prevent and relieve poverty or financial hardship by providing food with your help. What is a “Partner Agency”?